In this topic I will discuss how to configure interVLAN routing typically known as Router on a Stick. Notice that PC1 and PC2 are in different VLANs and different IP subnets. We are going to allow them to communicate with each other via Router A. First we are going to configure the trunk links between each of the switches and between switch C and Router A. I will use the range command to save keep typing the individual interfaces. We will come back to Router A a little later on to finish the trunk configuration. We need to configure the access ports and VLANs between the switches connected to PCs. 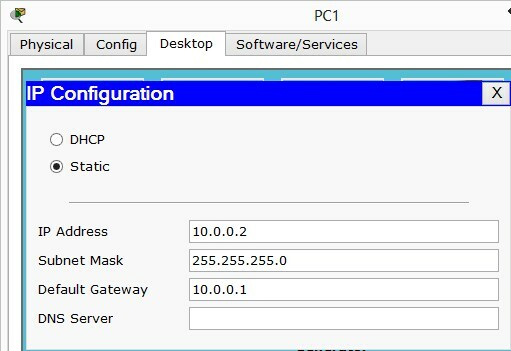 We will configure PC1 and PC2 with an IP address and default gateway. If we try and ping PC2 from PC1 the result will fail. Why? Because there’s no way for VLAN 10 and VLAN 20 to communicate, Also they’re in different subnets. To allow these two PCs to communicate we need to configure Router A to route frames between VLAN 10 and VLAN 20. If you noticed we set default gateways on PC1 and PC2, we will now configure these on Router A. This way, when PC1 or PC2 wants to send a frame to a different subnet, it will forward to the default gateway, the default gateway will lookup to see if it has an entry in its routing table if it does, it will forward otherwise it will drop the frame. We will configure two sub interfaces on Router A under fa0/0 one for VLAN 10 and one for VLAN20. First we need to bring up the fast ethernet 0/0 interface up, otherwise the sub interfaces once configured will not work. I tend to create sub-interfaces that match the VLAN number, this is handy when trying to troubleshoot as you can quickly identify which VLAN belongs to which sub-interface. 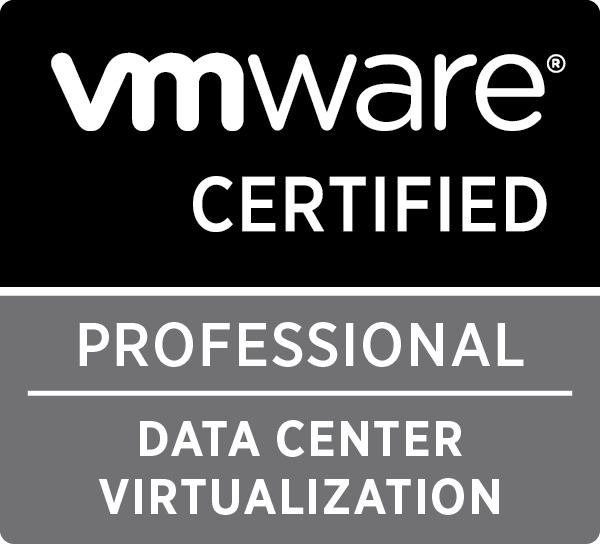 The encapsulation dot1q 10/20 command defines the sub interface as a trunk link and that it expects to send/receive VLAN 10/20 traffic on this interface. We verified that PC1 can communicate with PC2 above. 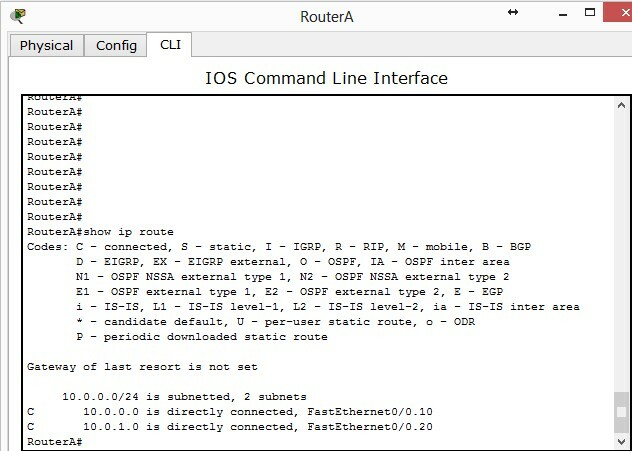 The above shows two directly connected routes, one for VLAN 10 and one for VLAN 20 this is how the router knows where to route to. show running-config can be used on the switches and routers to ensure correct access VLAN assigned, trunk links are configured and correct IP addresses. 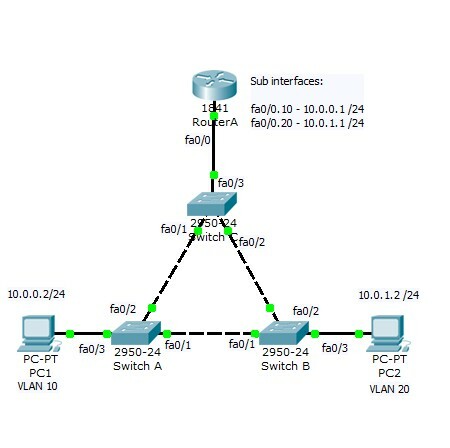 show vlan on the switches will show what VLANs are assigned to which ports. 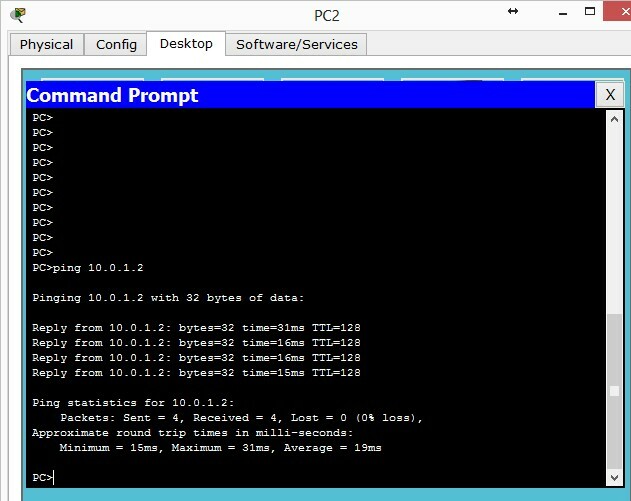 Ping can we be used to verify connectivity, if you cant ping the destination IP, ensure you can ping your local default gateway and then destination gateway to try and figure where the problems lies.